After assigning pupils to a homework task you will eventually have to collect their submissions. To mark submissions for a homework task, start the class where the homework was published. Next, click on the Homework tab along the top of the page. The homework sidebar will appear on the Set Homework tab. Click on the View homework tab. You will be presented with a list of previously published homework tasks. Click on the Submission button for the homework task of your choice to begin marking pupil submissions. The class will now be in submission view for the homework task. 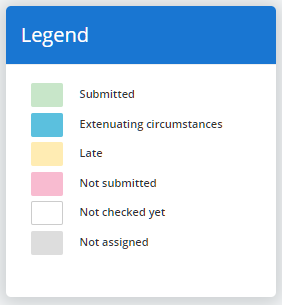 To mark a submission, click on a pupil tile to change their submission status. Submitted: The pupil has successfully handed the completed homework task in on time. Extenuating circumstances: The pupil has not handed the completed homework task in on time, but had a valid reason to do so. Late: The pupil has handed in completed homework, but it was handed in past the deadline. Not submitted: The pupil has failed to hand the completed homework task in on time. Not checked yet: There is no submission record for the pupil. Not assigned: The pupil has not been assigned to the homework task. To mark all submissions simultaneously, select a submission status from the drop down menu in the top right hand corner and click on the Set all button. 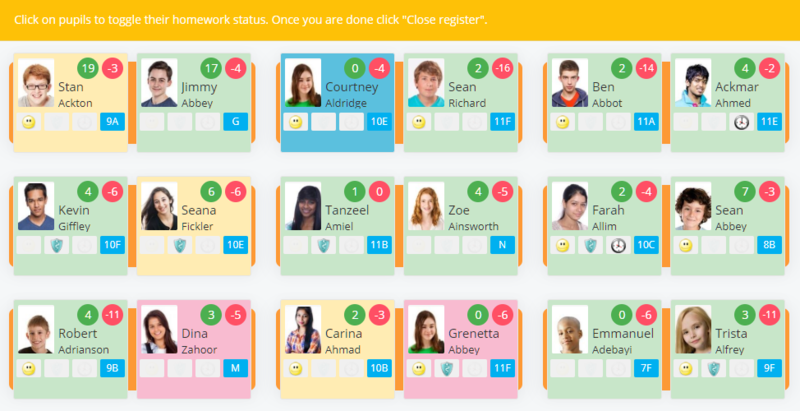 Once you have finished marking submissions for the homework task, click on the Close register button in the top right hand corner of the page.